Once established the rapid growth rate forms dense stands in both open and riparian areas that exclude native vegetation and prohibiting regeneration. The monospecific stands reduce diversity and alters habitat for wildlife. Can grow through tarmac and concrete (in some cases within dwellings) and therefore must be cleared completely before starting to build or lay roads. What this means to us is very similar to the issues with Himalayan Balsam in that native plants are reduced and the banks are exposed to increased erosion. 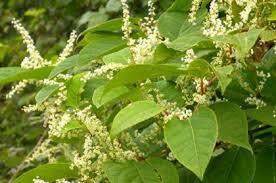 It can grow very dense and make access to the river very difficult. 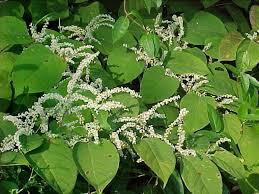 Japanese Knotweed is very vigorous and any control programme must be carefully managed. A piece of rhizome or stem material as small as a thumbnail can regenerate, and so measures must be put in place to mitigate the possibility of accidentally spreading the plant. Control must also take into account the wider environment to prevent reinvasion from likely corridors, such as fly-tipping, railway lines and watercourses. Mechanical excavation of soil contaminated with Japanese Knotweed rhizome can be undertaken if time is restricted with contaminated soil being stockpiled elsewhere on site for herbicide treatment, being buried on site or being taken to a licensed Landfill site. Excavation to landfill should be considered a last resort as this is highly expensive and environmentally damaging. Anglers should not attempt to take any action; this plant must be dealt with by professionals as a controlled waste product. If you find Japanese Knot Weed please report it to the club.